Carroll Shelby remains popular with enthusiasts. His autograph graces the glove box door on this 1967 G.T. 350. When the Mustang made its grand entrance at Ford dealerships across the country in April 1964, FoMoCo executives were hoping for 100,000 sales of the new car. They could have bet everything they had on that. In fact, first year model sales figures went well past the half-million mark. Putting sportiness into a compact and economical car, along with providing so many options and accessories, proved to be the right mix at the right time. While most were happy to have a Mustang with a six or a mild 289 2-bbl. V8, there were those who had to have the fastest version possible. That crowd could opt for the 289 4-bbl. “K” code engine with an advertised output of 271 horsepower. Still others had to have even more; thus, the Mustang became the basis for some wild automotive machinery—some of it for the drag strip, some for sports car competition, and some for the street. This 1967 Shelby GT350 is one of only 1,174 ordered that year and one of just 438 painted Brittany Blue. The most radical 1965 Mustangs were those that competed on NHRA drag strips as class A factory experimentals (or A/FX) and the privately entered “Quarter Horse” of Ron Pellegrini. The latter, with a fiberglass front clip, had a 427 High Riser shoehorned into an engine bay originally designed for the small block engine. The factory-backed A/FX cars were powered by the single overhead cammer (SOHC) 427. The 2+2 fastback bodies received extensive modifications to make the wide SOHC fit; the shock towers were eliminated and leaf springs acting as torsion bars hooked to the lower control arm were installed in their place. A fiberglass front end (with a bubble hood) lightened the load. Traction bars in back helped get traction for the rear tires, which were 10 inches wide—so wide, in fact, that the rear axle had to be narrowed to accommodate the brawny tires. The wheelbase was extended two inches as well. The A/FX cars did very well against the A/FX Mercury Comets and Mopars at the season opener NHRA Winternationals held at the Los Angeles County Fairgrounds. Two A/FX Mustangs made it to the final round at the NHRA Nationals at Indianapolis Raceway Park; Gas Rhonda was edged out by Les Ritchey for the class victory. Even more powerful Mustangs were the funny car types, which were fuel-injected and supercharged. Success in racing resulted in some free and positive publicity. Ford spent a lot of dollars on trying to keep their drivers in the winner’s circle. Though the Mustang did not really need any extra publicity, Ford wanted to make the car capable of handling production-class sports car racing, which led to a special Mustang for the street for 1965. This was, of course, the Shelby GT350, though specially prepared GT350Rs were actually used for the B-production class SCCA races. Fiberglass scoops are on the sail panels. 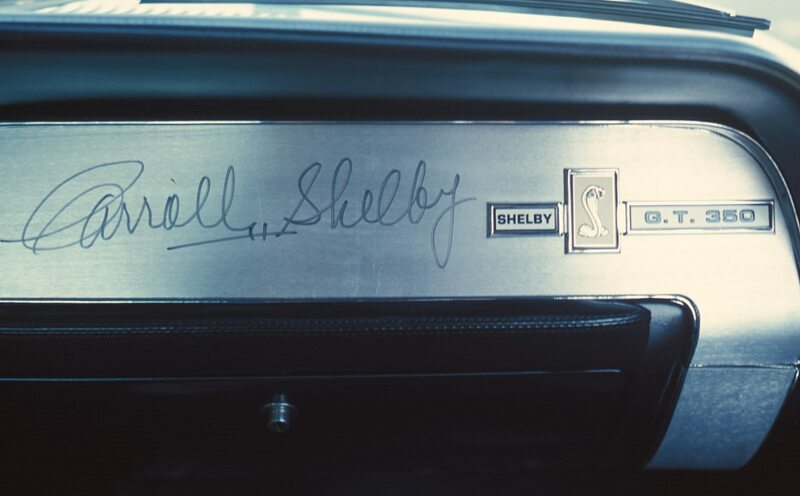 Carroll Shelby had made his mark in the racing arena with Ford powered racing cars, so logically Ford Motor Company’s Lee Iacocca hired him to see what Shelby could do to transform the Mustang into a race car. Shelby modified Mustang 2+2 fastbacks in his shop (Shelby American, Inc.) located at Los Angeles International Airport. The upgrades made there included increasing the output of the K-code 289 to 306 horsepower at a high revving 6,000 rpm, beefing up the suspension, installing a roll bar, and adding some noticeable exterior cues, so onlookers would recognize the car as no ordinary Mustang. The revisions that transformed the Mustang 2+2 into a race version GT350R proved to be more than adequate. The purpose of the car was to beat Chevrolet’s Corvette in SCCA B-production class, and it did just that in 1965 and again in 1966. Corvette had held the title eight consecutive times prior to this. Jerry Titus won the national title for the class with a GT350R. 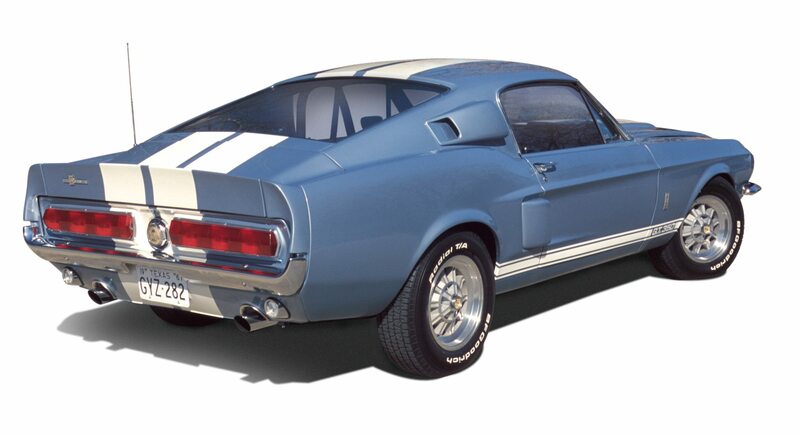 The Shelby GT350 sold for $4,547, a pricey window sticker in 1965. Its high cost, race-car handling and ride made for low production; only 562 were built for the model year. The Shelby modifications made the car easily recognizable as such. In back, taillights from the new Mercury Cougar were installed as well as a special trunk lid with an integral spoiler. Fiberglass scoops were applied in various locations. For 1966, the Shelby GT350 was made a little more civilized, increasing its curb appeal to more people. The previously standard Koni adjustable shocks and Detroit Locker rear end became options. The 1965 models came with a Borg-Warner T-10 four-speed transmission, but for 1966 a C4 automatic was offered at extra cost. The exhausts were extended; instead of exiting ahead of the rear wheels they went all the way to the rear of the car. Visibility was improved as the result of plexiglass inserts in the C-pillars, substituting for the previous year model’s louvers. Late in the year, Ford upped the performance ante with a Paxton supercharger added to the list of available options. The supercharger pushed the already potent 289 from 306 horsepower to about 450—over one-and-a-half horsepower per cubic inch! Hertz Rent-A-Car ordered 1,000 GT350Hs and this order, as well as the increased emphasis on comfort, helped boost production to approximately 2,400 cars. The 271-horsepower K-code 289 was modified to give the GT350 higher performance. The official rating remained at 306 horsepower for 1967, even though the steel tube headers and straight through mufflers of the past were deleted as standard equipment. The 1967 Mustang grew larger and heavier, thus did the Shelby. Some pounds were shaved off via fiberglass front fenders (as well with a fiberglass hood which had been standard previously.) The fastback body remained the basis for the Shelby, though it now came in two versions—the GT350 as before and a new GT500. The former kept its 289 as well as the choice of a Paxton supercharger while the GT500 received the 428 V8 as standard equipment. (Though not advertised, a 427 was offered as well.) 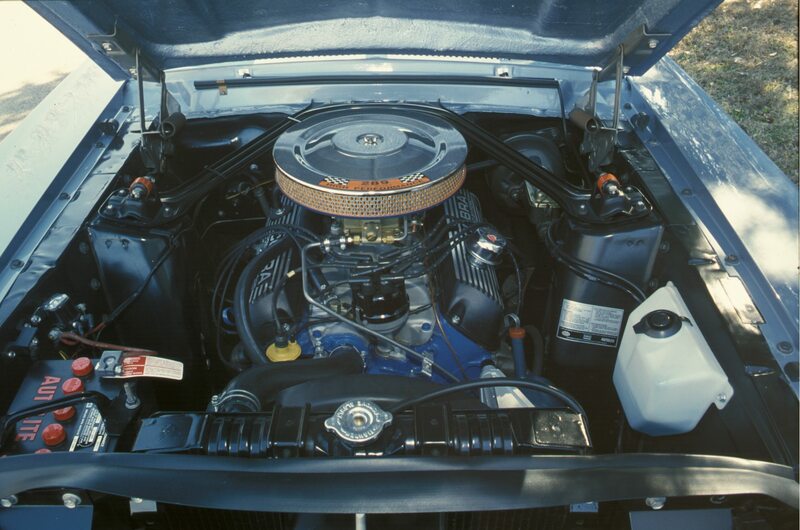 The Mustang for 1967 was designed so that the FE engines (390, 427 and 428) could easily fit the enlarged engine bay. 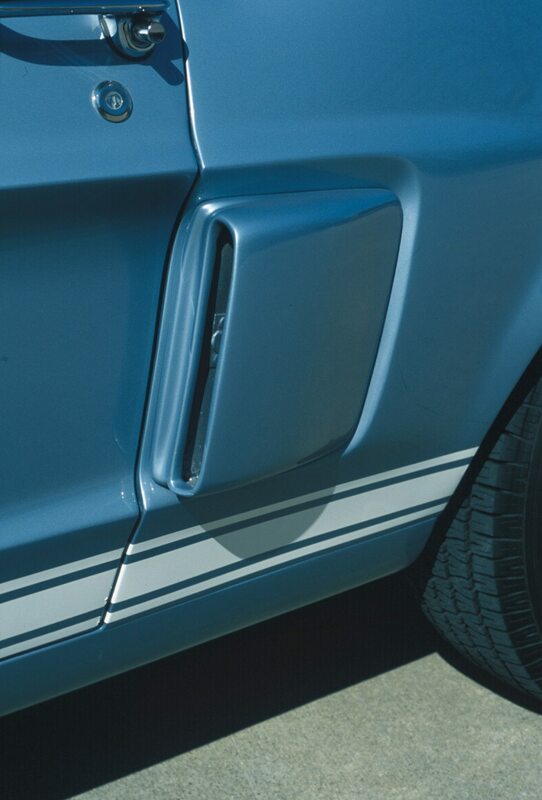 Though the 289 of the GT350 remained rated as before, it must have suffered some loss in power; the previously standard steel-tube exhaust headers and straight through mufflers were deleted. The serious enthusiast had to opt for the GT500 if the $4,195 base price (which did not include $250 of mandatory options) was not an obstacle. The 500’s big V8 capped with twin Holley four-barrels was rated at 355 horsepower at 5,400 revs per minute. Even with Ford’s greater emphasis on comfort and convenience and a little less on performance, the GT500 was a very good performer. Motor Trend tested one with the C6 and another with the four-speed. The automatic car performed better with a standing quarter-mile result of 14.9 seconds at 98mph. The guys at MT also tested GT350s—one with the C4 and the other with the four-speed. This time the four-speed was faster, though just barely—15.9 seconds at 90mph—though it was slower than the 1966 GT350. Clearly, the GT500 was the real performance car of the two Shelby offerings. This probably explains why it outsold its companion 2,050 to 1,174. 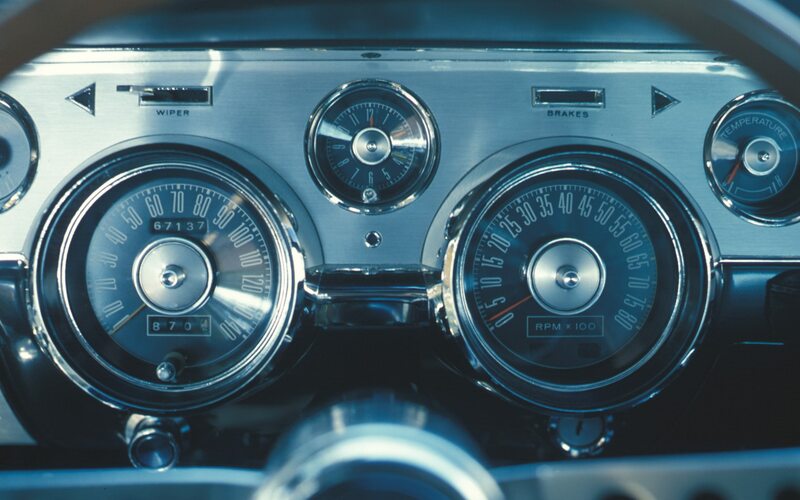 Unlike past Shelbys, the dash remained nearly unaltered from that of the Mustang. Additional gauges were mounted on the center underside of the dash. One of those 1,174 GT350s built for 1967 is shown here. 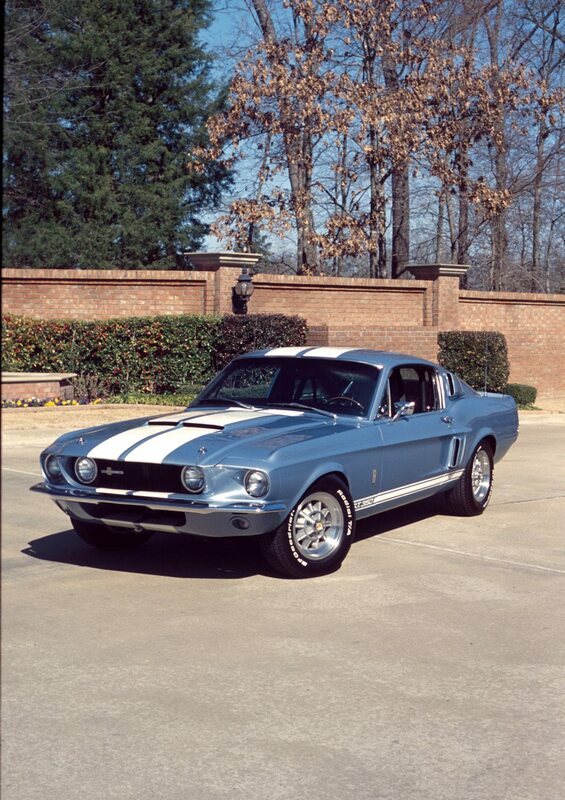 Craig Chesley of Tyler, Texas, owns our feature car and this is not the only Shelby Craig has owned; his supercharged 1966 GT350 was featured in the January 2000 issue of Car Collector. Currently, he also owns a red 1966 GT350H. The Brittany Blue Shelby is equipped with the mandatory options of power steering, power brakes, fold-down rear seat, and shoulder harnesses, as well as the optional C4 automatic, Le Mans stripes, radio and 10-spoke wheels. 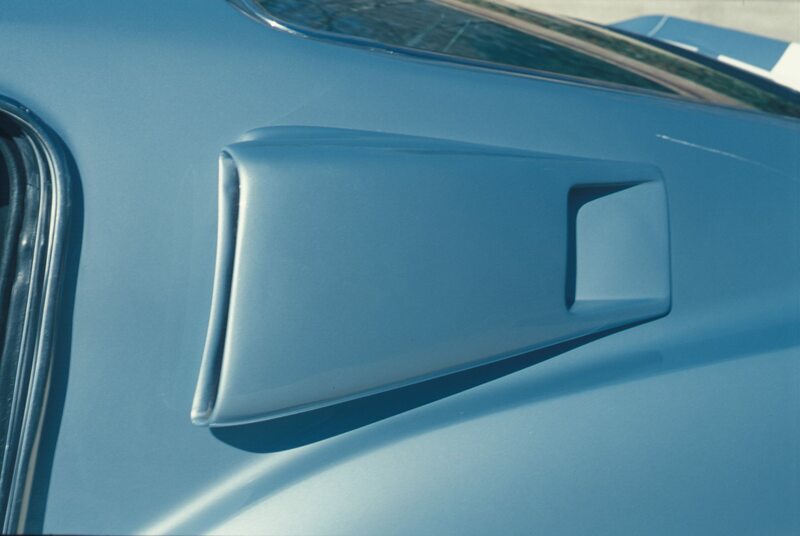 Functional scoops were mounted in a variety of locations including the quarter panels. They ducted air toward the brakes for cooling. The GT350’s previous owner, an aerospace engineer, restored the car. The Shelby required a total restoration, which occurred over a five-year period. The effort netted a Best of Show award from Pep Boys’ virtual car show in 2001. According to an official press release from Pep Boys, this GT350 “jumped out to a sizeable lead when public voting began.” There were more than 25,000 votes cast and when the voting ended, the winner received $2,000 worth of Pep Boys gift certificates and the “added distinction of having his car displayed in the grand entryway to the world-famous Peterson Automotive Museum,” said Pep Boys June 14, 2001, press release. According to Marti Auto Works, this Shelby is one of 438 GT350s painted Brittany Blue and one of only 353 built with the 289/C4 combination. This particular example began life in June 1967, as a Mustang 2+2 assembled at the San Jose plant. During our photo session numerous people slowed their vehicle to get a good look at this beautiful car—some even making more than one pass! Craig’s GT350 does not represent the fastest Shelby, but relatively few cars can generate as much interest. If you have a Shelby or another collectible you’d like to insure with us, let us show you how we are more than just another collector vehicle insurance company. We want to protect your passion! Click below for an online quote, or give us a call at 800.678.5173.